Apple proposes new flagship store in the MaCarthur Chambers building while other international retailers scout CBD for space. 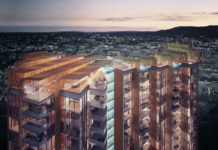 Brisbane’s CBD is currently undergoing extensive retail change with the introduction of international retail outlets who are scouting around for new retail space in the CBD. Today however, BD Online can confirm that a proposal for a new Apple Flagship store has been submitted in the MaCarthur Chambers building on the corner of Queen and Edward Street. The historic space formerly housed Dymocks before its relocation to Brisbane Central. The Flagship Apple store redevelopment includes a three level restoration of the historic interior, with two levels open to the public. The restoration will bring back the building’s original bronze style doors as well as missing stone wall panels. A new feature stairwell to the mezzanine level will also be built. The total floor area of the store which includes the basement level is 1,942m2. 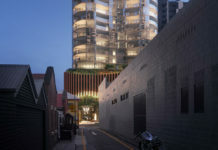 Apple have a history of taking up space in older historically significant buildings overseas, therefore the new MaCarthur Chambers store will be Australia’s largest and first character flagship store. It is also designed to “create a high quality retail outlet which showcases the architectural qualities of the original Assurance Chamber and adds contemporary elements of comparable quality”. The whole proposal can be viewed here. Meanwhile, international Spanish retailer Zara is also looking around the CBD for its first Queensland store following the opening of Zara store Sydney. The retail chain is rumoured to take up a lease of the current three level Borders site on the corner of Elizabeth and Albert Streets once Borders vacates the space within the next few months. 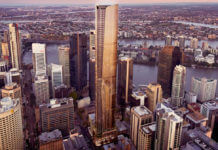 Gap and Gucci are also searching for space within the CBD, while Swarovski, Rodd & Gunn and R.M Williams have taken up Flagship positions in stage one of the Wintergarden Redevelopment. Today, Chanel confirmed that it would open it’s first Queensland store in Queens Plaza by early October this year. 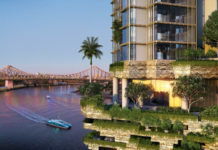 Previous articleBrisbane needs provocative design – and we need to support it. Can anyone tell me what is happening with the Apple store in MacArthur Chambers? Is ther work going on? Who is the construction company involved? Serves them right for wanting to do the full ‘glass stairs in a heritage building’ thing when they could have just grabbed the Borders building. Bit sad about Kell & Rigby though – they did work for my Dad years ago and seemed very competent. So is the Apple store still going ahead, or is it delayed? The article gave little indication to its future. that would be absoulutely wonderful I love their clothes and would like buy the whole shop. Anyone knows when the zara store gonna open? Any comment on the present status of the Apple Store Macarthur Central ? At present not much is happening. MacArthur Central is now boarded up and development has started. Is this the new Apple flagship store? Details anyone ? I work in the BOQ Centre and for those who havent noticed, signange is now up confirming the Apple Store is to open soon.